I really like the Petstages Purr Pillow cat toy. 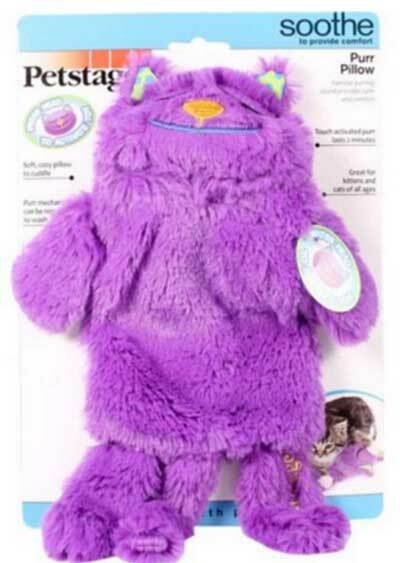 This soft plush toy makes a purring noise when your kitty lies on it. I first came to hear of the Petstages Purr Pillow from a veterinary colleague of mine. She had a client bring in a cat for an exam and as they entered the exam room, my colleague said, “What on earth is that noise?” She could hear the Purr Pillow loudly purring away. The kitty’s owner opened the cage and took out the purr pillow, placing it on the exam table. Immediately the cat walked out of the cage, and sat calmly on the pillow and stayed there quietly for the whole exam. It does seem that the purring had a nice calming effect on this cat. How does the Purr Pillow work? At first I thought the Purr Pillow would vibrate. But what it actually does is play a purring noise. The noise can be activated by touch such as when your kitty lies on it, or you can turn it on manually. The noise is LOUD! So why is purring soothing to cats? No one knows exactly why or how cats purr. However, cats that have no larynx (voice box) cannot purr, so we know that the larynx is involved somehow. Cats can purr when they are happy. But, they can also purr as a sign of extreme stress. I have seen cats with horrible injuries that arrive at the vet hospital purring. One theory states that when cats purr, the frequency of the purr works to strengthen bone density and help with pain relief. I personally think that a cat’s purr somehow helps the cat release endorphins which simply makes kitty feel really good. Is the Purr Pillow safe? I have no concerns with the safety of the Purr Pillow. The sound pack is safely velcroed inside. Also, it can be removed and the rest of the product can be thrown in the washing machine. Do all cats love the Purr Pillow? There are quite a few reviews for this product online. The vast majority say that cats really enjoyed the product. However there are a few that say that their cats paid no attention at all to their new purring pillow. The biggest complaint that people have online is that the purring only lasts for two minutes and has to be manually restarted. You can sometimes find the product at Walmart. You can also buy it directly off of the Petstages website although it’s more expensive than on Amazon. Products that would work well with the Purr Pillow. This product would go great with feliway. Feliway is something called a pheromone that helps cats relax. It’s not just marketing speak either. There is good scientific evidence that shows that it works. I wrote a thorough review on this which you can find here: Feliway for cats. Kitties would probably also love this combined with catnip. My favorite choice for catnip is Cosmic Catnip . Have you used this product? I’d love to hear your thoughts. *Note:If you purchase this product on Amazon after clicking through via the link on my site I’ll be paid a small affiliate commission. Please know that the reviews on this site are in now way influenced by whether or not I’ll get paid.